It has been right at one month since Disney World debuted their date-based ticket pricing system. We thought it would be a good time to check back in on ticket prices and see what changes we found. Each month we’ll go through the Disney website and pull the ticket prices shown. We’re looking at ticket only prices, no packages, discounts, etc. This will keep it fairly apples to apples so we can see how things change. For now, since it is a manual process, we are only pulling 4, 5, 6, 8- and 10-day ticket prices. Maybe someday we’ll have a script written that can scrape the Disney World ticket price website, but for now this is what we’ve got. These are one park per day tickets. No park hopper or other options added on. 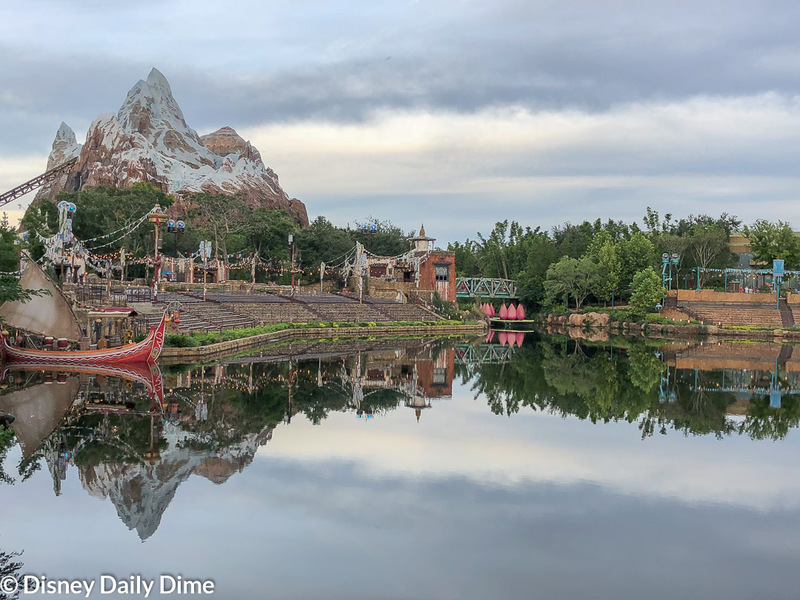 To start off our Disney World ticket price update for November 2018, we’ll first look at the 4-day ticket. One of the more popular options, it allows you to at least hit each park one day each while at Disney World. As you can see in the graph above, not much has changed. In fact, nothing has changed. Believe it or not, there are two lines in the graph. There is a blue line showing the prices as of October 16th, the day Disney unveiled its new pricing system and an orange line showing prices as of November 16th. You don’t see the blue line because it is covered by the orange. All quiet on the western front here. Same song, different verse. 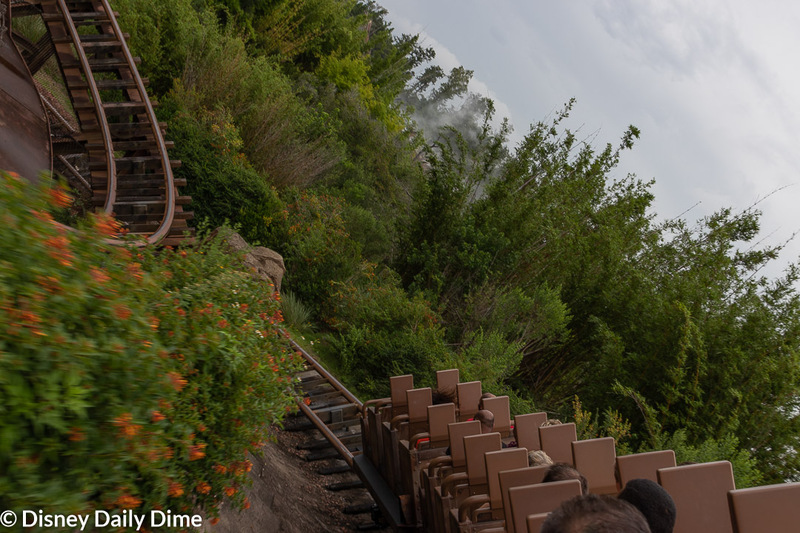 No changes in park ticket prices for the 5-day ticket. Just like 4- and 5-day Disney World tickets, no change in prices here. 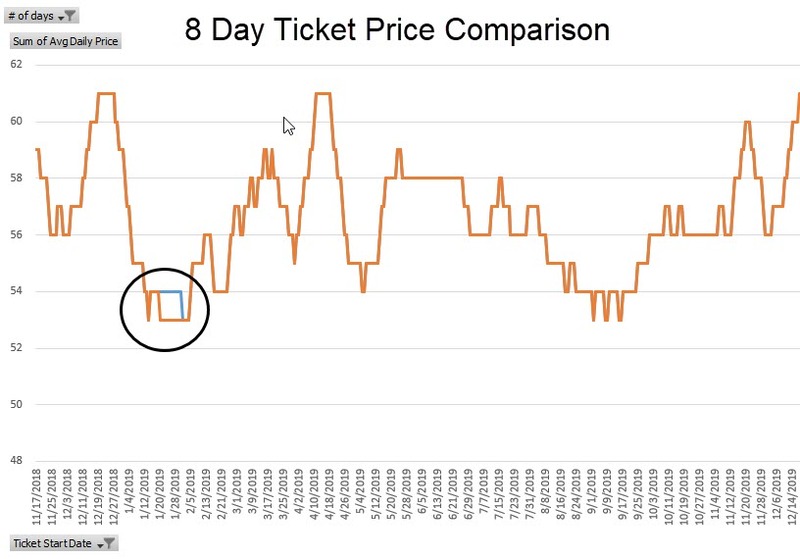 The 8-day Disney World ticket price did have a little movement in it for a 12-day period in late January 2019. Ticket prices declined from $54 per day to $53 per day. Not a big move in price, but this brings more conformity between the prices across the different ticket day options. The $54 price they started with when the new pricing system debuted was pretty flat over much of January. 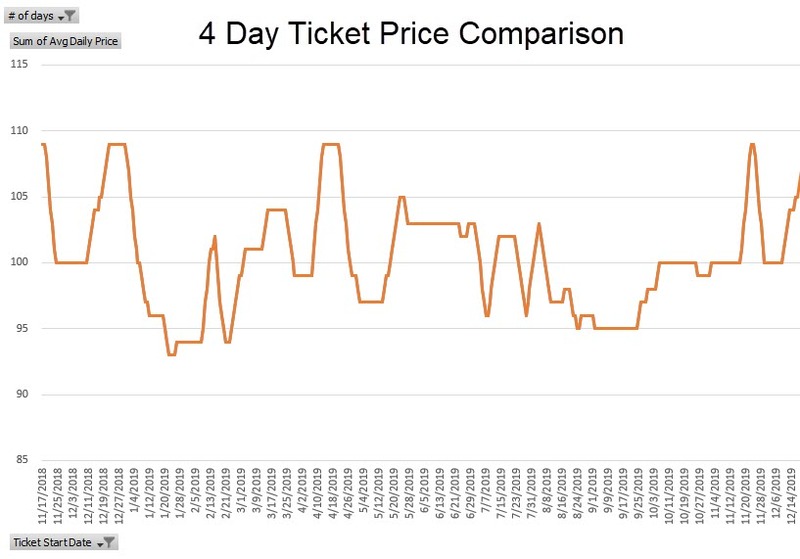 Other multi-day ticket prices we track show declines in price as you head into the latter part of January, so this gets it more in line with that structure. The exact days changed were January 20th through January 31st. I will say, this could also be a keying error on my part, but I don’t think so. I tried to check every data point in October when I pulled the first data set down. Again, I need to write a script to take the manual intervention out of this. Any programmers out there?! Much like the other multi-day tickets, there is no change in pricing on 10-day Disney World tickets. Yes, you did read that right. Christmas 2019! 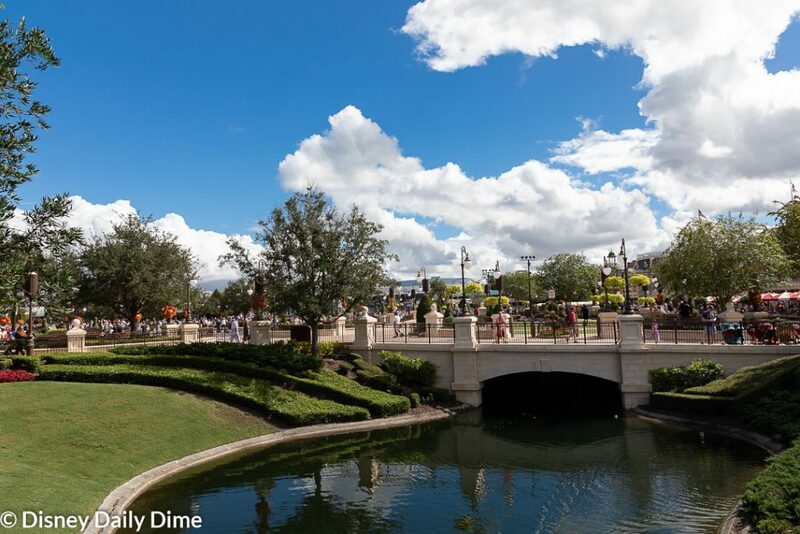 When the new Disney World date-based ticket pricing system launched in mid-October, the prices only went through mid-December 2019. Somewhere in the last month Disney unveiled their pricing for the remainder of that month and loaded it into their system. Here’s a chart with the 6 -day Disney World ticket prices too. This pattern of higher early Christmas prices and lower late Christmas prices plays out here as well. We’ll spare you the other graphs, but this pattern holds on the 5, 8- and 10-day tickets too. 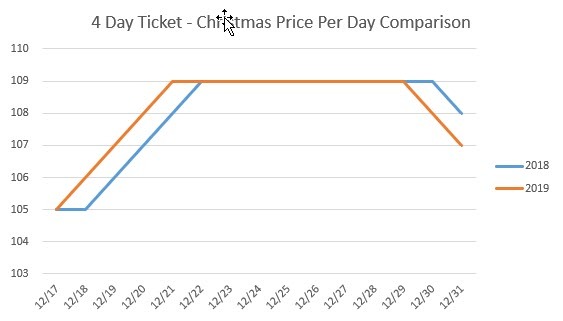 Our hypothesis on the year over year ticket prices being higher before Christmas and lower after has to do with when Christmas Day is. Christmas is on a Tuesday this year and a Wednesday in 2019. If families are trying to do full weeks leading into or out of Christmas and manage the weekends, we’re guessing Disney thinks more families will come earlier. Thus, they raise prices before Christmas and drop them after. We will say that we don’t expect the Christmas 2019 prices to have this level of parity with 2018 prices all the way through next year. Disney will put a price increase in at some point. Given that there was a price increase hidden in this ticket system change, we don’t expect another increase until mid-2019. 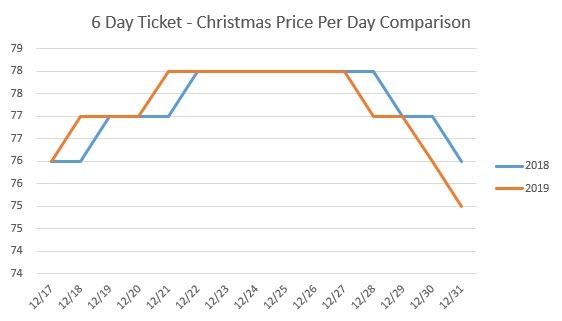 If you’re planning on going to Disney World around Christmas 2019, you probably want to get your tickets before then to beat the increase. Do you have your own theory as to why the Christmas prices are higher early and lower late? If so, drop down in the comments box below and let us know what you think! And that’s our Disney World ticket price update for November 2018. Not a ton of change in one month, but we’ll continue to monitor how prices change each and every month. We hope you enjoyed this article. As always, we appreciate it if you share our content on social media. It spreads the word on our blog and allows us to help more people (or at least entertain them a bit). Make sure you check back next month for our next ticket price update!